If you’re trying to decide whether to upgrade to the new GoPro HERO5 Blackfrom the previous model or have found a good deal on the HERO4 Black and aretrying to decide which to get, here’s a rundown of how the two models aredifferent and how they’re similar. Overall, the HERO5 takes the best features of the HERO4 Black and Silver andcombines them in a single camera while adding some interesting new featureslike voice control, video stabilization, a RAW photo format, automatic GPStagging, and automatic uploading to the new GoPro Plus cloud service. So the HERO5 Black is slightly larger than a naked HERO4 Black without ahousing. A built-in touchscreen display was one of the defining differences between theHERO4 Black and Silver-the Silver had it, the Black didn’t. 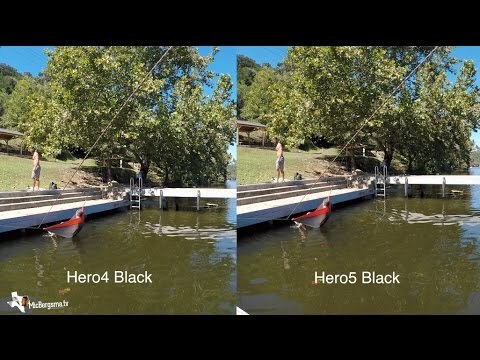 In the same way that the HERO4 Silver’s settings were easier to navigate on-camera thanks to the screen, I’ve found it to make a big difference in makingthe HERO5 Black much more user-friendly. That means two things: it’s one less thing thing to be hassling with while you’retrying to shoot, and the overall package of the HERO5 Black comes in smallerthan the combination of a HERO4 Black and the Standard Housing. The HERO5 Black uses the new USB-C connector while the HERO4 Black usesthe much older mini-USB connector. Some accessories for the HERO4 will work on the HERO5 Black, but manywon’t. The HERO5 Black does everything the HERO4 Black and HERO4 Silver do andthen quite a lot more. One of the best things about the HERO5 Black is that GoPro reduced the MSRPto $399.99, where the HERO4 Black’s MSRP started at $499. And that is apretty compelling feature in itself.